MOSCOW - Russia's top investigative body says it has identified the man who opened fire in a college in a Crimean town, killing 18 people and wounding more than 40. The Investigative Committee said an 18-year old student identified as Vladislav Roslyakov arrived at the vocational college in Kerch early Wednesday afternoon with a rifle and opened fire. The investigators said all the victims have died of gunshot wounds. The investigators had earlier put out a statement saying an improvised explosive device went off in the college. The investigators cited CCTTV footage showing that the man opened fire on people and later killed himself. The investigators said they will now treat the incident as a mass murder and not as a terrorist attack. Russian President Vladimir Putin says the attack on a college in Crimea was a tragedy and offered condolences to the victims' families. Putin, speaking Wednesday after talks with his visiting Egyptian counterpart Abdel-Fattah el-Sissi in the Black Sea resort of Sochi, said investigators are looking into the circumstances of the attack and its motives. 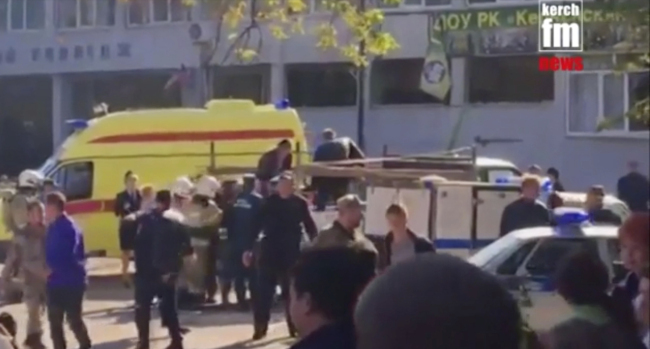 The top official in Crimea said 18 people were killed and over 40 wounded in Wednesday's attack on the vocational college in the city of Kerch in eastern Crimea. He said a student of the college was the sole attacker and killed himself. The top official in Crimea says 18 people have died and more than 40 have been wounded in an attack on a college in the Black Sea peninsula launched by one of its students. Sergei Aksyonov, the regional leader in Crimea, said that the student killed himself after the attack. He didn't name the man, saying only he was a local resident and was acting alone. Aksyonov's statement follows Russian officials' report that an explosive device ripped through the college in Kerch in eastern Crimea in a suspected terrorist attack.